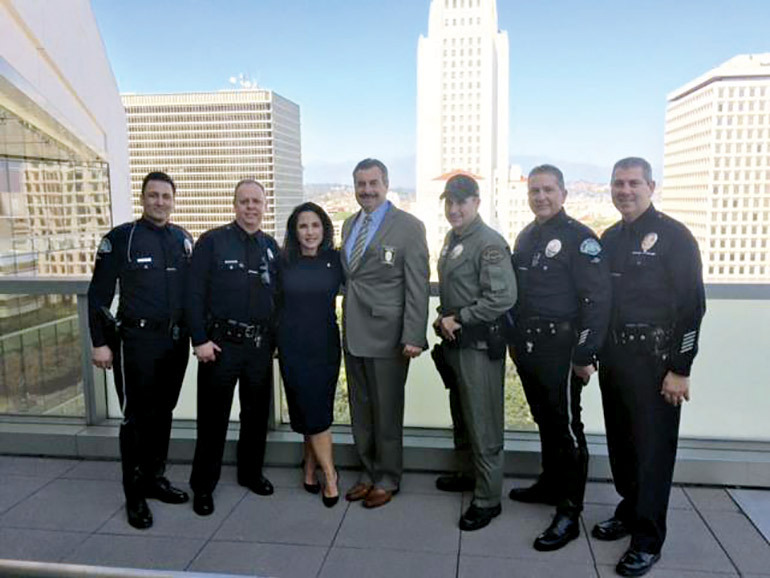 April was once again Reserve Appreciation Month at the LAPD. But this year was different in that the Department ramped up a few of the activities. Detective III Damien Levesque, in the Chief’s Office, spearheaded these efforts. 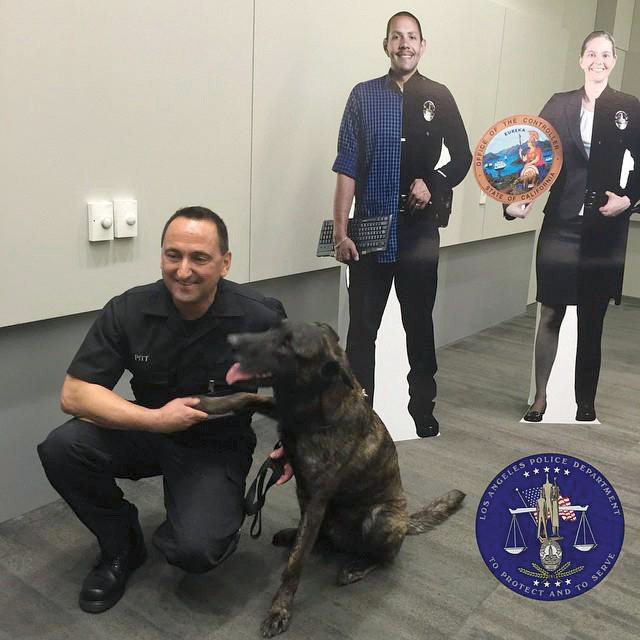 Specialist Dr. Michael Pitt and K-9 Thor received much of the press attention; standees of Reserve Officers Tim Whitmann and Rebecca Doten stand by. A brief history of the Corps and its origins are discussed, and then the video features Reserve Officers Timothy Widmann, J.T. Alpaugh and Rebecca Doten, and K-9 Specialist Dr. Michael Pitt. The theme of the video is how reserve officers have two careers: they go to their regular “day jobs,” and then they suit up to protect and serve with the LAPD. Officer Joel Morales’ filmmaking talents resulted in the video being viewed by 13,000 people on the LAPRF’s Facebook page. The video post reached nearly 45,000 people around the world. The video can be viewed by going to the video album of the Los Angeles Police Reserve Foundation Facebook page. The video was played on a large screen in the PAB lobby, as part of a Reserve Appreciation display. 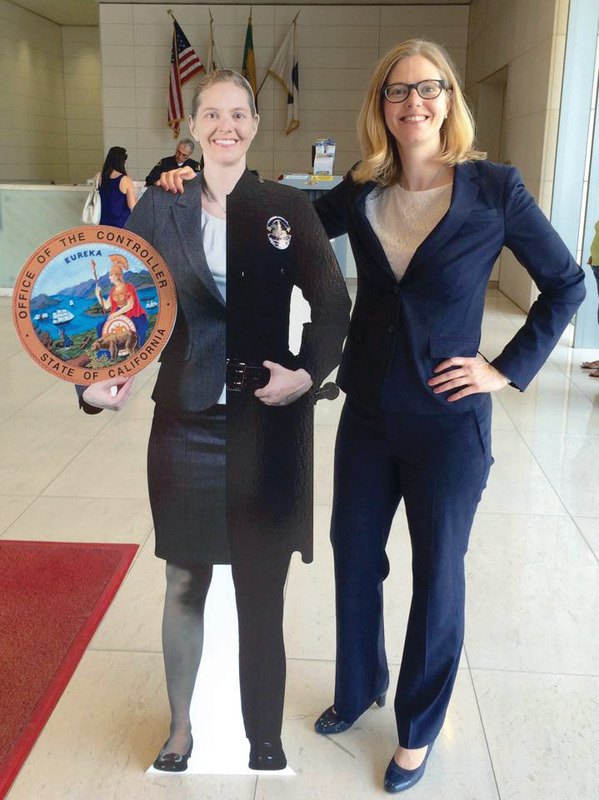 The display included life-sized cardboard cutouts of Officers Doten and Widmann, symbolizing their “double life”: one side dressed in their LAPD Class As, and the other side dressed for their primary career. The lobby display also included the uniform of Reserve Officer Paul V. Martinez, who served in the Corps from 1951 to 1993. The uniform had the old diamond-shaped badge, reserve shoulder patches and white hat. (Editor’s note: click here for more on the Martinez family.) Also on display was the Twice a Citizen Community Leader Award presented to former LAPRF President Mel Kennedy in 2014. On April 9, the Office of the Chief held a Reserve Media Day as part of the Chief’s media availability/press conference. Chief Beck spoke about the Reserve Corps, the Appreciation Month and the annual Twice a Citizen banquet, which would be held two nights later, on April 11. Reserve officers from several different divisions and specialties were on hand. Retired K-9 Thor seemed to get most of the attention afterward, as the media cameras surrounded him and his handler, Specialist Michael Pitt. The LAPRF thanks Chief of Police Charlie Beck for once again recognizing the Corps; Captain Ruby F. Malachi, Assistant Commanding Officer, Media Relations and Community Affairs Group, the Office of the Chief of Police; and all the officers in the OCOP, Community Relations Section.